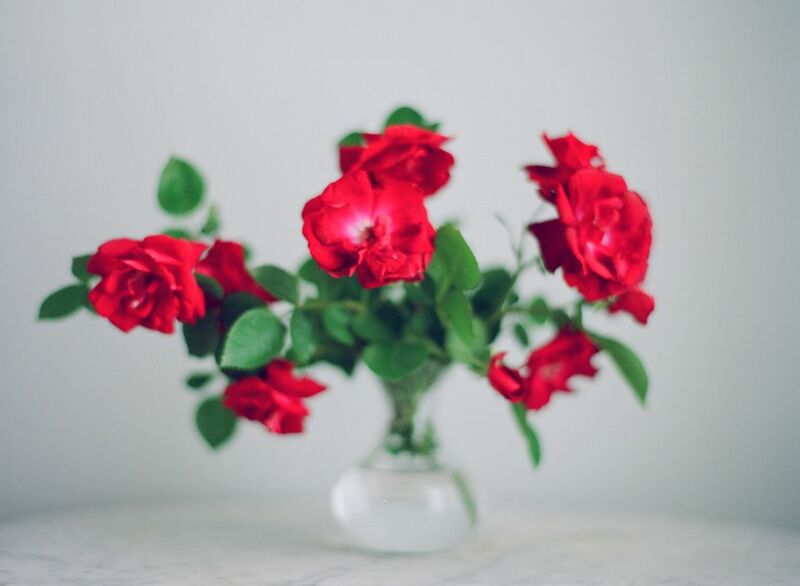 You purchased a classic rose bouquet for a holiday or celebration, and all seemed well, until the roses flopped over, looking like perfect buds on mushy stems. What happened? Bent neck in roses is something the florist trade works hard to avoid, as it prevents customers from returning in the future. Learn what causes rose bent neck, and how to prevent it from spoiling your investment. When growers harvest roses too early, they are at risk for becoming what’s known in the trade as “bullets.” You may have received a bouquet in the past that held much promise, but never realized its potential as the flowers stubbornly held onto their bud form, eventually withering away. These so-called bullets are the duds of the rose world and are more likely to succumb to bent neck failure. Don’t take a “bullet” when you purchase your roses: look for roses that appear full and lush, and show signs of unfurling if still in bud. Avoid those roses that are sealed up tighter than a tick. Commercially produced rose varieties "Cool Water" and "Pretty Blinda" are two examples of roses that are more prone to bent neck than others are. Florists selling susceptible rose varieties may counter this problem by adding calcium sulfate to the vase water, which promotes bud opening and increases flower longevity. Modern rose cultivars are increasingly resistant to bent neck, and the consumer shouldn’t worry about researching varieties that won’t flop. When in doubt, choose white or yellow roses, as they tend to open quickly and live past the first few days when bent neck usually occurs. Low-budget flower operations cut costs by removing flower-preserving elements from the post-harvest process, like refrigeration and hydration. The roses may not be old when they arrive at the florist, but just as a dog supposedly ages seven years for every year a person ages, a poorly handled rose will age many times faster than a superior-grade rose. When is a bargain not a bargain? When your cheap rose arrangement doesn’t make it past the first 24 hours. Spend a bit more, and enjoy roses that stand at attention for a week or longer. This is where a good relationship with your local florist pays off. Roses that are on the sale rack might be past the sell-by date. Do you want to take home a bouquet that has shined most brightly in the market, and is on its last legs when the florist sleeve is applied? Roses that didn’t have proper refrigeration are also at risk of bent neck. If you’re shopping in a different city and aren’t familiar with the florist, check the roses for dry, brown leaves. They are a sure sign that the roses are old or were stored in warm temperatures. One of the biggest errors of grocery store floral departments is the proximity of flowers to produce. You can almost see the flowers shrivel in horror against the onslaught of the ethylene miasma wafting over from the apples. Ethylene gas and cut flowers don’t mix: this natural hormone in gas form causes premature aging and can contribute to bent neck. Apples and pears aren’t the only culprits; cigarette smoke contains ethylene as well. It turns out that second-hand smoke is bad for people and flowers! If water doesn’t flow into the rose bloom, bent neck will occur within 36 hours. This process may have already begun at the florist, but it often occurs when the consumer doesn’t properly condition the flowers at home. You should always recut your rose stems under running water before you display them. Use flower food to nourish the flowers and reduce bacteria, and change the water daily to keep bacteria counts low. Bent neck is as often attributed to an air bubble in the stem as it is a stem clogged with bacteria, which is not something we like to associate with the romance of roses.